AMSTERDAM (Reuters) - Dutch farmers have devised a hot and spicy way to stop rabbits and rodents from munching their lettuce, carrots and wheat. Spraying fields with the American sauce Tabasco sends the rabbits "three feet in the air" with shock and running for cover, said a spokesman for a local agriculture cooperative. The Dutch animal protection society is happy with the spicy repellent, unworried by the possibility of burned bunny mouths. "Preventive measures are exactly what we want. It's better than going into the fields with a shotgun," said animal welfare spokesman Niels Doorlandt. The farmers will now try to make Tabasco an officially recognized pesticide for subsidized use on a larger scale. At least five small supermarket-sized bottles of the spicy sauce are needed for spraying 1 hectare (2.5 acres) of crops. 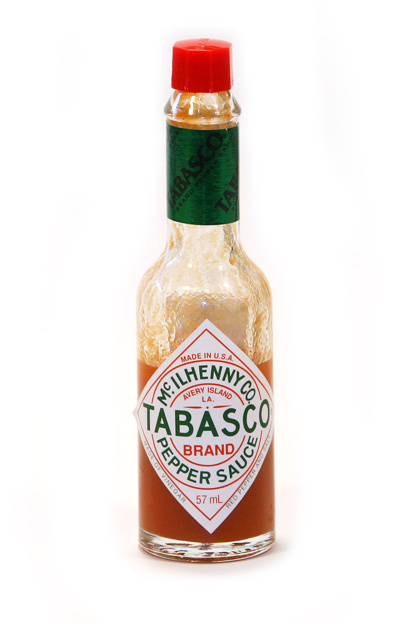 Although rain washes the Tabasco off, the crops are only sprayed in the first phases of growth to spare the taste buds of human consumers. Everyone that is, except for the rabbits, who farmers say jump a meter in the air and run for cover after tasting the spicy sauce. Farmers say its working. And animal protection spokesman Niels Doorlandt calls it a wonderful alternative to the shotgun. "This initiative is a perfect example of how you can get rid of the problem without killing the animals or harming them in any way," he says. "It could be possible that the lips of the rabbits are hurt by the Tabasco, but the next time the rabbit will think, 'Don't do this again,' so they won't use their teeth to eat our precious crops." Local farmers tried other remedies first: garlic sauce and Worcestershire sauce. But apparently nothing keeps the rabbits and rodents away quite like Tabasco. So far, it has been used on lettuce, green beans, barley and wheat, with tests under way on young apple and cherry trees. It takes about five small bottles to spray one hectare of crops. The Dutch distributor says farmers have had problems keeping the spicy sauce on the crops because of the rainy Dutch climate, but they believe they have solved that problem by mixing the sauce with a sticky substance. The concoction is only sprayed on parts of the plant that are not harvested to spare the taste buds of consumers. "Living on a farm outside of London (Ont. ), our vegetable garden is constantly being attacked by voracious deer and rabbits," writes Lesley Fitzpatrick from a farm outside of London, Ont. "Last year, my husband strung wire around the garden and dangled AOL CDs at regular intervals all the way around. It worked like a charm. The slightest motion would set them stirring, reflecting the smallest amount of light and scaring the critters away. Too bad it doesn't work on weeds." 1) Can you spray this tabasco/water mix on tomato plants? 2) Is there any vegetable that it cannot be sprayed on? 3) Does it hinder the growth of the plants in any way? 4) Does it change the taste of the vegetables or does washing carefully remove it? soon by all the rabbits! Follow Up: So far the Tabasco in water is working great at keeping the rabbits away. I was very skeptical, but by this time last year the rabbits had completely destroyed my large vegetable garden and had eaten all my pansies. My garden looks gorgeous. The verdict is still out on how the veggies taste because nothing has harvested yet. But it has definitely kept the rabbits at bay! Teresa Y.